Tourism has always used the best shot. Beaches in brochures are enticingly empty or inhabited by immaculately toned models. The sun is setting with the concrete tower block cropped just out of view. Lazy travel cliches paint the best possible verbal pictures too, so that neigbourhoods are relentlessly ‘vibrant’,markets always ‘bustle’, and seas across the world lap aquamarine, turquoise or azure. We sell people these holiday ideals, then leave out the bad bits, and hope they will be enjoying themselves too much to complain that it really wasn’t like-what-it-said-in-the-brochure. Nowhere is this more true than in the way we present our most iconic wildlife. Lions, elephants, rhinos and tigers provide the easiest of shorthand when we want to promote our trips. We’ve used the awe they inspire to sell our products – through our websites, brochures, photographs or articles – for decades. Unfortunately, our pin-ups are being driven to the brink of extinction. Just 13 rhinos were killed by poachers in South Africa in 2007. By 2011, that number rose to 448. Last year, more than 650 were killed this way. Carry on growing at this rate, many experts say, and the black rhino could be heading towards extinct in South Africa from 2016. 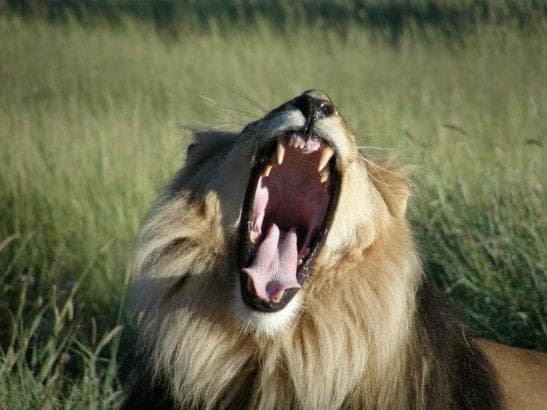 Meanwhile, according to CITES, exports of lion bones from South Africa rose 250 per cent between 2009 and 2010 and some 1400 lion and leopard trophies were exported from the country over the same period. As for elephants – a conservative estimate for 2011 puts the figure at more than 25,000 killed for their tusks that year. And tigers? There are more of them in captivity in Texas than there are left in the wild. The illegal trade in dead animal parts is now such big business that Global Financial Integrity estimates its annual profits at roughly $7.8-$10 billion, fifth in value behind illegal traffic in drugs, humans, oil and counterfeit. But flick through a travel brochure, or browse the pages of a website selling trips to see some of these animals, and there will often be little – if any – reference to how desperate the situation has become. It’s not surprising. We need to sell our articles and promote our holidays in order to get people to go on them. And – or so the prevailing and unchallenged wisdom goes – people don’t want to know about these problems when they are thinking about their holidays. As responsible tourism operators we are supposed to offer authentic experiences and tell the truth about the circumstances surrounding them. Yet this seems to be ignored when it comes to the way we present endangered wildlife to the world. The main argument for this would appear to be along these lines: our job as promoters of tourism is to bring travellers to places. And when we bring them to places where they might see endangered animals, then these tourists can do a great deal for protection and conservation. Their presence deters poachers and the money they spend encourages locals to look after the animals. People go to these places in large part because we promote them with images of tigers, gorillas and other iconic species. Maybe that’s where our job starts and ends. And maybe a glossy misrepresentation is a necessary compromise for the delivering of a greater, more important, good. Better that than essential work suffering because we have a crisis of conscience about how we market our trips. But shouldn’t we at least examine these assumptions, and ask not only is our behaviour still responsible, but also, whether we might be able to do something more? After all, we have the eyes and ears of a global audience, all looking to learn from us how and where to spend their money when they go to the places where these animals live. Does it matter, for example, how we present the lure of highly endangered Big 5 ‘trophy’ species to sell our wildlife trips? Should we ensure that we always make some reference to the threats they face whenever we talk about them? After all, most people who come to our websites won’t then go on and book holidays with us – but couldn’t we still help a few of them become more aware of the urgency of these animals’ plight? Shouldn’t we also commit to giving greater visibility on our websites to information and links to those working at the front line to protect these creatures, so they can focus their time on doing their jobs instead of fundraising? Many of these organisations work on shoestring budgets, and their skills are in frontline wildlife conservation. Since we may be better at communicating messages to international consumers and possible donors, should we not at least give over prominent space on our homepages and in our publications to so doing? The magazine Africa Geographic has been pioneering in this – dedicating its entire April 2012 issue to the issue of rhino poaching, and featuring ever since a monthly section ‘Rhino Watch’ over several pages. Just think what effect it might have if across the board, companies, publications, brochures and websites followed suit. These animals are the basis of much of the money we earn – tourists simply want to see them more than they do the other animals, and will pay more for the ever-dwindling chance. So isn’t it wrong – to say nothing of short-sighted – for a travel company to profit from these animals, if it does not also donate a percentage of those profits towards direct efforts to ensure their survival? The owners of Lion Sands, which adjoins South Africa’s Kruger Park, seem to think so, as it was reported in November last year that they were donating a portion of their annual tourism income to the Stop Rhino Poaching campaign. At 114,665 ZAR, their first annual donation was the largest ever by a single lodge. Can anyone justify not making more effort to promote the cause of these animals and encouraging their guests to also donate or lobby for greater protection as well? For example, couldn’t companies that run safari lodges ensure that the brochures for relevant wildlife-protection organisations are inserted in the information folder of every guest and brief their ranger-guides to tell the whole story about the animals guests are shooting with their cameras? Might these lodges even rethink the impact of their ‘hunting chic’ interior décor – the endless draping of their sofas and floors with pelts and the hanging of horns on the walls? When supposedly responsible wildlife tourism celebrates and fetishises the act of hunting in this way, doesn’t it undermine efforts to persuade affluent Vietnamese or Chinese consumers that they are wrong to associate the dead remains of such animals with status and virility? Everywhere you look, a macabre dynamics of extinction governs our relationship with these animals. For hunters, the rarer an animal is, the more valuable its trophy becomes, and the more they have to pay to obtain a license to kill one. So too for tourism – the more ‘endangered’ an animal is, the more people will pay to shoot it with their cameras, and the greater its image’s ‘worth’ in our marketing. But this dynamic only has one ending. To see where that end might be, it would be revealing to analyse the use of critically endangered animals in tourism marketing. At what point did Vietnam, whose last Javan rhino went extinct in 2011, stop using its image as a promotional tool? And when did China stop marketing the Baiji river dolphin, declared extinct in 2007? By way of contrast, the The Northern White rhino was declared only ‘probably extinct’ in 2011. So does ‘probably extinct’ mean it’s still OK to use its image in a brochure? Who decides where we draw the line? If we are to question how we portray these victims, we should also interrogate how we depict the places where trafficked animals end up. For example, shouldn’t responsible tourism companies be explaining to their guests just how many elephants are illegally imported from Burma for use in Thailand’s tourism industry each year? And what of that cliché of tourism promotion I began with – the ‘bustling markets’ where tourists are sold the chance of authentic connection with their destination’s daily life? As we sell these images, shouldn’t we also tell our audience how illegal ivory is readily available at the Khan al-Khalili market in Cairo? Or how Bangkok’s Chatuchak Market is not just a place to pick up knocked off designer goods, but also ‘an international hub for the sale and distribution of endangered species’? Earlier this year I was on safari in South Africa. A ranger told me that he and the other rangers still radio one another to share the location of any exciting wildlife they find. However, they have stopped doing this when they find rhino. They know the poachers are listening in and could use the information to track and kill the animals. For the rangers, the time has come when their best answer is silence. I don’t know what the correct response from the tourism industry is. But isn’t now at least the time for us to talk urgently to one another about how we best use our voices? Before extinction makes silence our only option too.